In a medium bowl, whip together marscarpone, whipping cream, Worchestershire sauce, and hot pepper sauce until smooth and light. Fold in chopped salmon, dill, and lemon zest. Lay puff pastry out on a floured surface. DO NOT ROLL OUT! 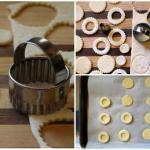 Cut one puff pastry sheet into small circles, about 1 1/2 - 2 inches across. Put these circles on the prepared baking sheet. Cut the second puff pastry sheet into small circles (the same size). Cut a small circle out of the middle of each one of these circles. Save the small circles! Brush each of the circles on the baking sheet with beaten egg. Place one "donut" pastry circle on top of each of the egg-washed circles. Brush the top of the donut circles with egg-wash.
cut small decorative shapes from remaining puff pastry, to be used as garnish. Bake in preheated oven for 20 minutes, or until golden brown. Remove from oven and place on cooling rack. Allow to cool completely. 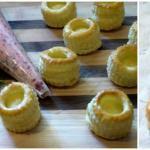 Pipe each pastry cup full of filling. 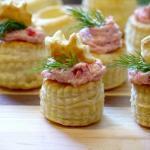 Garnish with fresh dill and small pastry shapes.